Since no one has actually seen a dragon, what a dragon looks like is strictly in the eyes of the beholder. 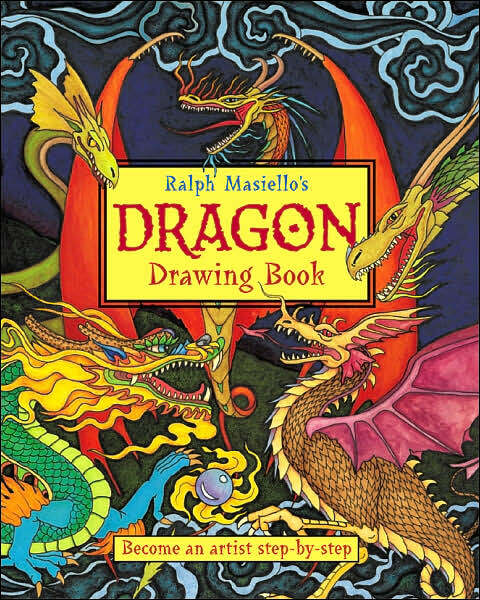 For that reason, the art of drawing dragons is a popular one. Imagination rules! The Great Book of Dragon Patterns by Lora S. Irish [745.4 IRI] contains patterns that you can copy to use in any number of crafts projects. If you have a child who loves to color, you can photocopy some of the patterns and let the child loose with crayons and markers, sequins and glitter. Your child's imagination is limitless! If you've seen How to Train Your Dragon, and you want to read some stories about dragons, you're in luck--a look in our catalog reveals 252 entries under the subject heading, Dragons - Fiction. When Eric and his friends finally return home from Droon, they discover that Gethwing, the moon dragon, has kidnapped most of the townspeople, including their parents, and is on the hunt for a magical object to become more powerful. Two children must find a way around their father's "no pets" rule when a friendly dragon appears in their backyard. Two teens who discover they are sharing the same dream of dragons fight to stop the evil dictator from bringing their dreams to life in the form of a terrible basilisk with the power to literally scare people to death. All day, Baby Dragon turns down other animals' offers to go play or find a snack while he waits for his mother to return for him, but at nightfall, he agrees to go with Crocodile to find her. Finding a baby dragon accidentally left alive after his older brother's dragonquest, Darek risks death and the anger of his people in trying to return it to the Valley of the Dragons. Princess Andromeda, chosen to be the virgin sacrifice to a dragon, decides to defend herself and face the dragon alone; however, she is joined by Sir George, an inexperienced knight, who helps her track down the dragon's lair. Princess Rose musters up courage to face the dragon that threatens the small towns in the Northern Valley, only to discover the dragon is actually the Lord of the Locusts; and meanwhile, her sister, Princess Briar, embarks on a more sinister quest. Wrongly condemned of witchcraft, fifteen-year-old Alys is tempted to take revenge on her accusers when the dragon to which she has been sacrificed turns out to be an ally. The film is based on the book of the same name by Cressida Cowell [J COW]. Cowell continues the story of Hiccup the Viking in several more books [all J COW]. We recently added two easy readers that are based upon the movie: How to Train Your Dragon: Hiccup the Hero, and How to Train Your Dragon: Meet the Dragons, both are by Cathy Hapka [E HAP]. I think parents and teachers are more afraid of poetry than kids are, and thus, by the time kids get to the age where they're able to read and write poetry on their own, they've often picked up on the adults' negativity. Adult negativity is all a result of the old-fashioned way of teaching poetry--memorize long, boring, narrative poems written by long dead Englishmen, or, analyze, analyze, analyze the themes, metaphors, etc. of the "Neoclassicists," "Romantics," etc. until the reading of a poem becomes an ordeal. Those days are over! 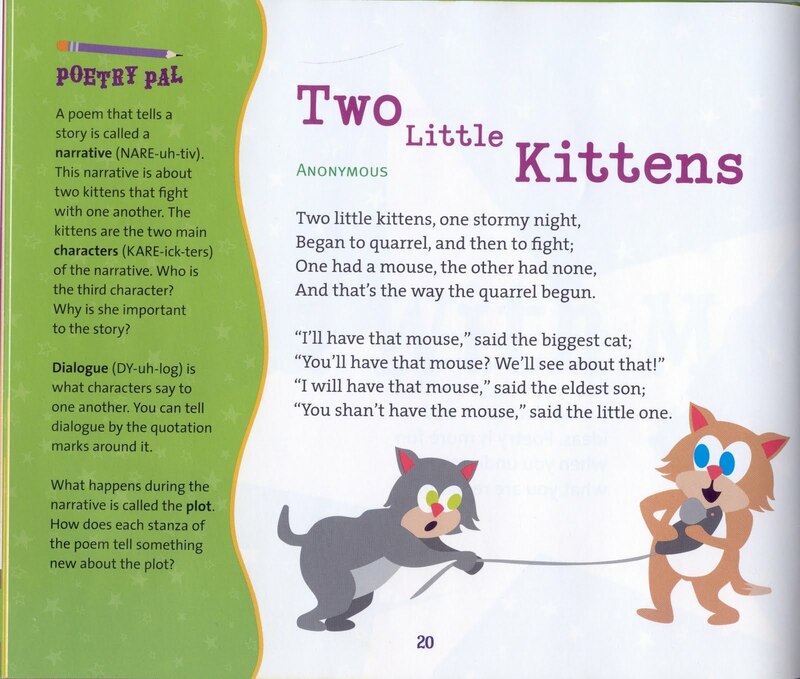 There are gazillions of poems written just for kids, and kids can now actually enjoy reading them! A great little 32-page book from our children's room is Guppies to Puppies: Reading, Writing, and Reciting Poems About Pets by Susan M. Freese [J 808.1 FRE]. The whole idea of this book is smart. Collect a group of poems written about one of kids' favorite things, pets, and you've already got a foot in the door. Use clear, simple language in explaining the concepts of poetry, encourage the kids to write, read aloud, talk about their reactions, and look (closely at their surroundings, look for more, etc. ), and you will actively ENGAGE the kids in poetry! Can you tell I'm fond of this book? Here's a page from the book to give you an idea of how it is set up. To read the rest of the poem, though, you'll have to borrow (or buy) the book! Head over to The Drift Record/Julie Larios for this week's Poetry Friday Round-Up. It's never too late to create your own! If you have a purple sweater, or shirt, or a scarf, pull it out and wear it this Friday, March 26, for Epilepsy Awareness Day. It's a day in which people can learn about epilepsy and support those who have it. Epilepsy has long been a misunderstood and hidden illness, and it's time to bring it out into the light. 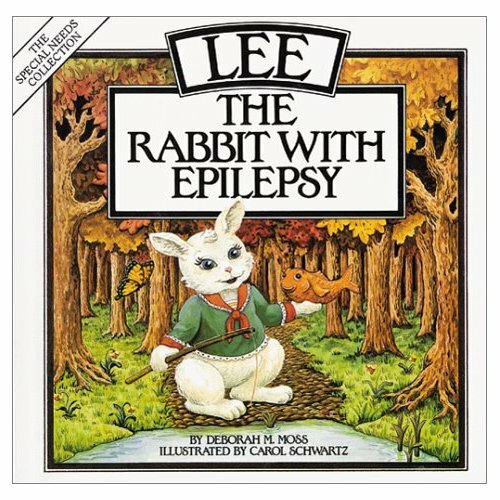 For information about epilepsy, visit the Epilepsy Foundation website. Or borrow one of our books in the 616.853 section. We have books of information for children, too, including a picture book for the younger ones, Lee: The Rabbit With Epilepsy by Deborah M. Moss [JP MOS]. To learn more about Purple Day, click here. In a Carmelite monastery outside present-day Los Angeles, life goes on in a manner virtually un-changed for centuries. Sister John of the Cross has spent years there in the service of God. And there, she alone experiences visions of such dazzling power and insight that she is looked upon as a spiritual master. But Sister John's visions are accompanied by powerful headaches, and when a doctor reveals that they may be dangerous, she faces a devastating choice. For if her spiritual gifts are symptoms of illness rather than grace, will a "cure" mean the end of her visions and a soul once again dry and searching? Writer Elmore Leonard published his first novel back in 1953! It was a western. He's been publishing ever since! The books he is most recognized for are his mysteries, especially the ones that have been made into movies, like Get Shorty [F LEO and DVD GET]. We have several dozen of his novels on our shelves [F LEO]. One of Leonard's western short stories, "Fire in the Hole," is now being made into a tv series called "Justified." It premiered last week on FX, and a review can be found here. You can read the original story on the Harper Collins' website. Leonard was interviewed on All Things Considered recently, and it's fun to listen to him talk about his characters and the actual locations that inspired his work. One of the things I learned from the radio segment was that the films 3:10 to Yuma were based on a Leonard novel (we have both the 1957 and 2007 film versions [DVD THR]). Modern science has helped unravel many art and literary mysteries, but the latest mystery to be unraveled was the result of good old sleuthing. The play, Double Falsehood, at one time attributed to William Shakespeare and then claimed to be a hoax, is now considered to be the real deal. Read the article from The Telegraph to learn the complex story of lost manuscripts, collaborations, and adaptations. The literary sleuth who determined the play's authenticity, took ten years and compared word usage in Double Falsehood to usage in other of Shakespeare's plays. He's a prime example of stick-to-itiveness! All those volumes of The Complete Works of William Shakespeare [822.33 SHA], which have graced library shelves for years and years, are now "incomplete." Who woulda thunk it? A long-lost work of Shakespeare, newly found. A killer who stages the Bard's extravagant murders as flesh-and-blood realities. Moving between twenty-first-century America and seventeenth-century England, The Book of Air and Shadows is a modern thriller that brilliantly re-creates William Shakespeare's life at the turn of the seventeenth century and combines an ingenious and intricately layered plot with a devastating portrait of a contemporary man on the brink of self-discovery...or self-destruction. This is the perfect time of year to highlight an anthology called Bright Wings: An Illustrated Anthology of Poems about Birds [821 BRI]. Bright Wings was edited by former U.S. Poet Laureate, Billy Collins. The book is beautifully illustrated by David Allen Sibley, creator of Sibley's Birding Basics [598 SIB] and The Sibley Guide to Birds [598 SIB]. In his introduction Collins explains his reasoning behind leaving out some of the better known bird poems such as Gerard Manley Hopkins' "The Windhover." ...no editorial regrets were felt at the decision to leave them out. Instead, air time is given to many lesser-known poems, particularly more contemporary ones, in order to give the reader a better chance of being taken by surprise. Visit the blog with the really long name, Some Novel Ideas: Book Reviews, Discussions, and Curriculum Plans for the Middle School Classroom, where you'll find this week's Poetry Friday Round-Up. Horror is not my thing--I'd rather drink a warm Bud Light than sit through a horror movie (gag, gag)! And, I would never, ever, pick up a book of horror. But, that doesn't stop me from purchasing horror titles for the library, as I know the genre has many fans! 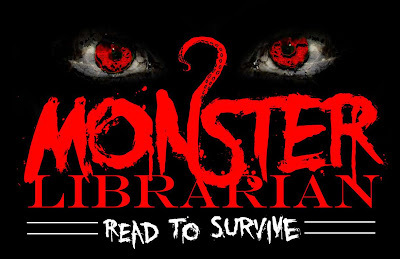 A source for readers of horror fiction to find another book to read and a source for librarians to develop their collections and provide readers advisory. One recent novel we added to our collection, Last Days by Brian Evenson [F EVE] was too HORRORible for our resident horror fan, Barbara. Whether that is a comment on the plot, or the writing, I'll never tell--you'll have to read it yourself. I just put in an order card for Seth Grahame-Smith's Abraham Lincoln: Vampire Hunter, a new title that is getting a lot of exposure in the media. Look for it in a few weeks. And don't forget to pick up one of the horror "classics" such as King's The Shining [F KIN] or William Peter Blatty's The Exorcist [F BLA], both of which are also available on DVD. Are you wearing green? I hope so! It's St. Patrick's Day! 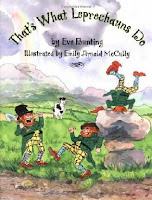 The legendary creatures known in Ireland as leprechauns were part of a group of fairies known as Luchorpan, which means "the wee ones." Over the years, the name luchorpan became confused with an Irish word meaning, "one-shoemaker." 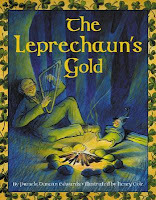 Since shoemakers had a reputation for living alone and having a grumpy nature, the leprechaun was depicted as a solitary creature, usually working on a single shoe rather than a pair. He was a wizened, bearded dwarf who wore a green suit and cap and worked day and night mending the shoes of the other fairies. We have plenty more, too. Have a great day and watch out for the leprechauns! I'm not going to rant about library books and materials being town property, and that by not returning them, you would be considered a petty thief (okay, maybe I will, but consider yourself warned and stop reading here). I am going to direct you to an article by Sarah Netter on the ABC News Website, "Return Library Books or Else: Borrowers Arrested for Failing to Return Overdue Books, DVDs: Frustrated by Loss of Property, Towns Resort to Arresting Negligent Library Patrons." Read it please, send it to those of your friends who may not want to be bothered returning library materials and dismiss overdue notices as harassment. The people who were arrested were arrested because they failed to appear in court. Of course they ignored the court summons because they ignored those overdue notices they received. Hey, most libraries have outdoor bookdrops--if the perps were tired of receiving harassing notices, then they could have driven by the library under the cover of darkness and RETURNED THE ITEMS. Simple. For books about book theft we have two mysteries (duh! ): Death in Dublin by Bartholomew Gill [MYS GIL] and Schemers by Bill Pronzini [MYS PRO]. 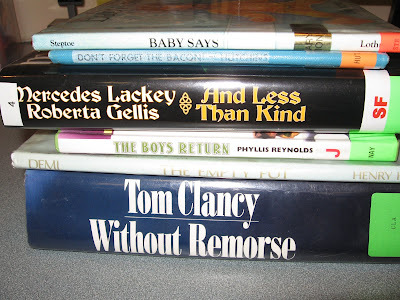 Last week the Poetry Friday Round-Up led me to the blog 100 Scope Notes where I found an absolutely fabulous new way to create poetry--using the titles on book spines! Teachers and librarians take note: what better way to get older kids familiar with your collection than to have them browse the shelves looking for titles to incorporate into a poem. Along the way I guarantee some title will pique the student's curiosity enough so that he/she will pick up the book and read it. Here's a challenge for you. Create your own book spine poem, take a picture and send it to me, or, if you don't have a camera, write down the book titles and if we have those books here, I'll put them together and take a picture of your poem. 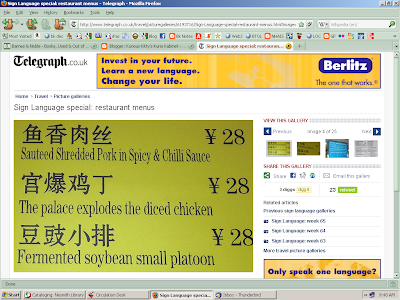 Send to dmayrATnesmithlibraryDOTorg (replacing the bolded words with the appropriate symbols). Today would have been Jack Kerouac's 88th birthday had he lived. Kerouac hailed from nearby Lowell, Massachusetts, and that fair city recognizes him with a commemorative park and an annual Kerouac festival held on the first weekend in October. Tonight and tomorrow, there's a little birthday celebration being held, for a listing of events, click here. Many people don't know that Kerouac also wrote poetry; some of his poems can be found in The Portable Jack Kerouac [813.54 KER]. A few of his "haikus" are included. Kerouac was one of the first American writers to embrace haiku. 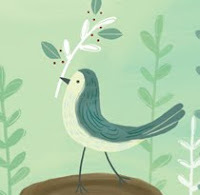 The Poetry Friday Round-Up is being hosted by Becky's Book Reviews. This coming Sunday, March 14, HBO is showing the first part of a ten-part miniseries, The Pacific, starting at 9:00 PM. The miniseries is based, in part, of first-hand accounts of participants in the World War II's Pacific campaign. One of the books is Helmet for My Pillow: From Parris Island to the Pacific: A Young Man's Stirring Account of Combat in World War II by Robert Leckie [B LEC]. We have many other books on the war in the Pacific including Tears in the Darkness: The Story of the Bataan Death March and Its Aftermath by Michael Norman [940.5472 NOR] and Ghost Soldiers: The Forgotten Epic Story of World War II's Most Dramatic Mission by Hampton Sides [940.54 SID]. The Pacific campaign is the subject of several works of fiction and films including The Pilots by James Spencer [F SPE], The Thin Red Line [DVD THI], and South Pacific [DVD SOU]. Today, the women of the Women Airforce Service Pilots, WASP, active during World War II, will be awarded Congressional Gold Medals. 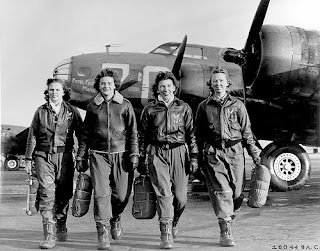 It is more than 65 years since the WASP were disbanded and nearly forgotten by the American public. Yesterday, NPR's Morning Edition had a extended report on the WASP. The website includes additional material such as photos and essays that you won't want to miss. More information on the WASP can be found at the National Museum of the US Air Force website. Click here to start. Congratulations to these daring and brave women who paved the way. Kathryn Bigelow made history Sunday night by becoming the first woman to win a "Best Director" Oscar for her direction of The Hurt Locker [DVD HUR]. (The Hurt Locker also won the "Best Picture" Oscar!) Isn't it depressing that in the 21st century women still have to make history by becoming the "first woman to..."? It's not like women haven't been directing films! Even from the first, with silent movies, women such as actress Mary Pickford were directing. In the 1940s and 50s Ida Lupino directed six films. Although many contemporary women are directing, they are the exception. So, let's celebrate Bigelow's success and not bemoan the fact that it took so long for a woman's work to be honored. The Beagle Brigade has absolutely nothing to do with Charles M. Schulz's Snoopy! My co-worker, Carolyn, alerted me to the Beagle Brigade, and I thought I'd share it with you. their human partners. They search travelers’ luggage for prohibited fruits, plants, and meat that could harbor harmful plant and animal pests and diseases. These detector dogs work with APHIS inspectors and x-ray technology to prevent the entry of prohibited agricultural items. The APHIS is the U.S. Department of Agriculture's Plant Health Inspection Service. Check out Beagle Brigade information provided by the USDA by clicking here, and information on the APHIS here. Besides being good detector dogs, beagles make great pets (this is not a personal opinion, I find beagles too yappy for my tastes), and of course, they are the inspiration for that beloved pet, Snoopy. If you're looking into a beagle as a pet, we have a number of books that can provide information on dog ownership in the 636.7 section. Our children's room has The Beagle by Charlotte Wilcox [J 636.7 WIL] and Puggles by Jill C. Wheeler [J 636.76 WHE]--a puggle is a pug-beagle mix. Poetry Out Loud has become a huge event over the past few years. The subtitle for the program is "The National Recitation Contest." It is a contest for high school students in which they recite poetry from memory. New Hampshire is having its east regional final on Monday, March 8, at Southern New Hampshire University. The winner will go on to compete with other NH students on March 20, at Keene State, and the state winner will go on to compete against other state finalists in Washington, DC, on April 27. The next time you're in our poetry section, look for Poetry Out Loud [821.008 POE], and The Spoken Word Revolution: (Slam, Hip Hop, & the Poetry of a New Generation) [811.508 SPO], which comes with a CD. For more fun with poetry, visit Teaching Books for the Poetry Friday Round-Up. 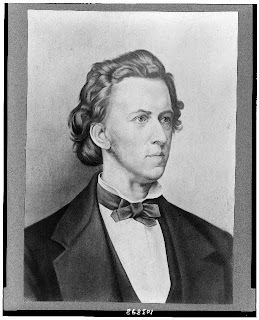 Some time in the past week, was the 200th anniversary of the birth of Polish composer, Frederic Chopin. There is some uncertainty as to the exact date, February 22? March 1? Warsaw, Poland decided to celebrate Chopin's 200th for the entire period, 2/22 through 3/1 with free, round-the-clock concerts! What fun! I don't know if it was a nod to Chopin's birthday, but Jeffrey Deaver's 2010 release is The Chopin Manuscript: A Serial Thriller [AB/CD DEAV], a mystery co-written with 14 other writers. Now you may ask, What could the library possibly have in its collection that would connect with that? Well, we just so happen to have Japanese Jive: Wacky and Wonderful Products from Japan by Caroline McKeldin [428 MCK] where you'll find food products such as "Choco Mushi Bread" and "Hello Kitty Pre-Buttered Toast." How much fun is that? As part of "The Big Read: New Hampshire Reads To Kill a Mockingbird," libraries, schools, bookstores and other organizations across the Granite State will be holding nearly 200 events throughout the month, including book discussions, film screenings, a panel discussion on adapting literature to film, presentations by local attorneys, programs on topics related to the themes of the novel and appearances by Atticus Finch himself. The Center for the Book at the New Hampshire State Library received a grant from the NEA to coordinate this statewide project. The Center for the Book chose to focus on To Kill a Mockingbird not only because it is a great coming of age story but also because of the many topics of discussion it inspires: who is a hero, the importance of standing up for what is right, the role of defense attorneys in society, relationships between the races, courage, justice and more. 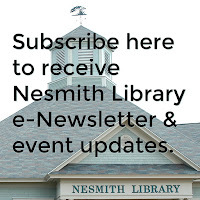 The Nesmith Library is hosting screenings and discussions every Thursday night during March, and the first Thursday in April. This week we start off with a viewing of the 1962 film starring Gregory Peck as Atticus Finch, a role for which Peck won an Oscar. The film starts at 7:00 pm in the multipurpose room. The following Thursdays will be discussions of the book/film. We have copies of the book available at the front desk. On April 1 there will be a staged reading (please call Carl at 432-7154 if you'd like to read a part). Join us for one or all of our weeks of celebration of this great American classic. if it takes you a bit longer to finish a project--it took 1,800 years to build the Great Wall of China! Discover new destinations and travel videos.